Description: THE SALOMON AIRA 76 WITH LITHIUM 10 BINDINGS IS Designed to excel in groomed conditions. This new Aira is tuned for frontside performance with smaller radius sidecuts and less tip and tail rocker making for a better groomer ski that can still handle off-piste exploration well. Skis very well for a $399 package but does have a speed limit. All-Terrain Rocker 2.0 – With a slight tip and tail rise, All-Terrain Rocker 2.0 adds an extra dimension of versatility and control for all mountain skiing. Camber in the middle of the ski and full length contact guarantees strong edge grip, stability and power for hard snow and piste skiing. In addition to the excellent terrain absorption and intuitive turn initiation, the slight twin rocker also allows the ski to pivot much easier when the ski is flat, increasing control and maneuverability in all conditions. Woodcore – On-snow stability and rebound with an extra level of forgiveness and weight savings. 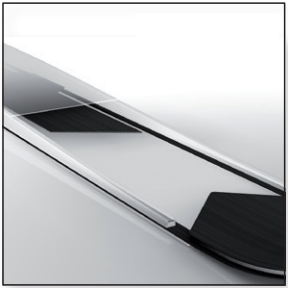 Basalt Layer – Basalt fiber layer running the length of the ski provides outstanding dampening and vibration absorption. Salomon Lithium 10 W Bindings Included – DIN Range 3 - 10. Best for: Beginner and intermediate skiers who ski at slower to moderate speeds that like to ski everywhere. Salomon has worked hard at making one ski does it all models and this is one for mellow skiers. Great for casual tours of the mountain.